Digital induction water descaler especially used at high hardness water treating. Good reasons of stable operation, long-time efficiency, long-distance effective signal transfer, which widely used at oily water, chemical industry, electricity, metallurgical industry, textile, and waste water. Prevent Scale: Electronic Induction water treatment equipment forms electromagnetic field which regularly changes frequency and intensity. The field makes carbonate ion forming quantity Aragonite. When mineral content exceed the saturation solubility, carbonate ion will form the Aragonite preferential. The tendency of forming Calcite will reduce. The adhesion of Aragonite is weak and Aragonite is soft, flocculent and suspend on the water. It is easy to remove by water flow to reaches to the purpose of preventing scale. Cleaning Scale: The scale which is on the surface of pipe disassembles to carbonate ion. The carbonate will form the Aragonite instead of Calcite in AV function. What’s more, the scale will be off from pipe surface. Kill bacterial: Scale is breeding ground of bacterial. If the scale is cleaned. That’s means, the breeding ground of bacterial is cleaned. What’s more, the electromagnetic field will damage the cell’s cytoderm to cause difficult to survive. The solubility ability and dissolve of oxygen will improve in water after treated to inhibit anaerobic bacterial survive. Descaling and prevent corrosion: Water rust will be cleaned in electromagnetic field. It will produce the Metal oxide film which can inhibit the water rust producing. Color metallurgical, steel mill cooling system, heat exchange system, electricity cooling system. Beer factory, beverage bottle clean plant. Swim pool heat-supply system, filtering and sterilizer equipment. Increase heat exchange rate, good for keeping a stable process. It shows excellent benefits especially in chemical companies. It reduces pump energy consumption, as thick water scale increase flow resistance. It also helps improve heat conductivity factor, increase heat using rate. Take 350MW electricity plant units as example. It requires coal consumption exceed 1.2T/H, whole year cost 0.6M$. Electrical induction descaler helps solve problems, avoid scale forming, which equals to save 0.6M$ per year. Electrical induction descaler bear much higher water hardness, concentration value reach to 4-6, compare with traditional treating ways. If operation 8000hours per year, save water (80-44)c/h×8000h=28.8m3/year. Tradition way is to add chemical dose, Take coal-chemical company as example. Pipe diameter 800mm: water supply 60m3/h, concentration value 2.5, solution concentration 50mg/L, chemical cost: 2000$/ton, effective ingredients 50%.If operate 8000hours a year, chemical dosage:60m3/h×8000h×50mg/L÷50%÷2.5=19.2ton, save USD38,350 per year. Electrical induction descaler helps equipment avoid corrosion in structure, extend lifetime 30%. Electrical induction descaler has small size. No need cut pipeline, safe operation, weak electricity and magnetism, not harmful to human and equipment. It keep equipment away from corrosion failure. DESCALER creates a frequency-modulated electromagnetic field inside the supply pipe. This field forces the dissolved calcium (magnesium) and bicarbonate ions to create the crystallizing nuclei of calcium (magnesium) carbonate in the bulk of the water. These microcrystals continuously grow (the snowball effect) and they flow with the water in the form of suspended particles. Their size and shape is much different to those formed in untreated water, they don`t stick at the piping walls, heating elements of boilers or washing machines and they remain in suspension until discharged to drain. A completed unit consists of a control box, signal wire. control box create electromagnetic field. Signal wire wound around pipes. Connect with power supply, electromagnetic signal transfer deliveries to wire. 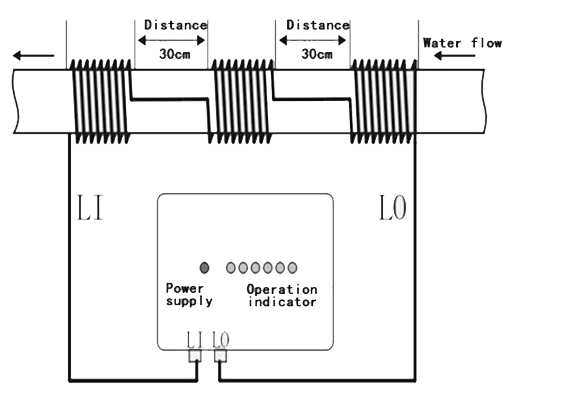 Wire transfer electromagnetic to water. Remark: twist wire means wound wire. 1. Install at ventilate place, with 220VAC 50HZ power supply. Fasten Control box on the wall, or on water pipe. Keep away from big power appliance (2meters), to avoid magnetism signal interruption. 2. Distance between control box and pipe not more than 2meters. 3.Make sure pipe is straight, and appearance is clean, smooth, no thermal cover, painting. 4.Fix wire part closet to the device on the water pipe. 5. Fasten wire around pipe by mean of plastic clip. 6.Wind wire based on right-hand magnetism law. Coil direction same as flow direction. 7. Cover with plastic tape outside coil, in case loose or scrape. 8. Users can add a protective fence for protection. Connect with power supply. Turn on main board power switch. Green lights on indicates working condition. MAKE SURE full water flow through water descaler.